Celebrate Shrove Tuesday with a Scottish twist. Taking all the flavours of a traditional Cullen Skink soup - Smoked Haddock, Potatoes, Leeks and Milk - and using them as a savoury pancake day filling. Say Bonjour to Crepes with a Scottish accent. Much to good to save only for Pancake Day! For the uninitiated, Cullen Skink possibly doesn't sound the most enticing of foods but I can assure you that it is. Hailing from Cullen, a small fishing village on the North East coast of Scotland, it's a hearty soup made of milk, smoked fish, potatoes and leeks. If you fancy giving it a go head to my recipe for Cullen Skink - A traditional Scottish Smoked Haddock Soup. 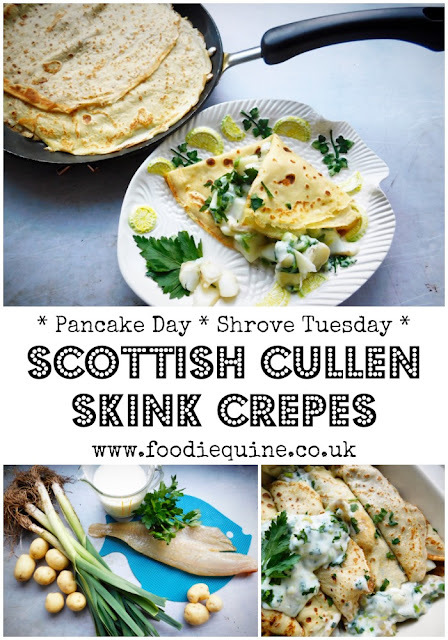 I'm a huge fan of savoury crepes/pancakes so with pancake day beckoning and purchases of leeks and smoked haddock made at Stonehaven Farmer's Market I decided to combine them both in my Cullen Skink Crepes. With this recipe you have a couple of different options when it comes to serving. You can either serve immediately in individual folded pancakes or use the filling within rolled crepes which are then baked in the oven. The choice is yours. Either way if you want to make up the batch of 8 pancakes in advance you can do so and stack them up interleaved with greaseproof paper. 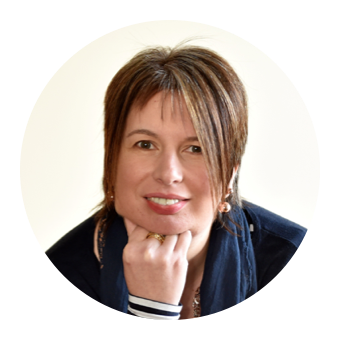 If you fancy experimenting a wee bit more with this recipe I reckon bacon lardons and/or sweetcorn would make a great addition and turn the Skink Crepes into Chowder Crepes. Put the flour and a pinch of salt in a bowl and make a well in the centre. Break the eggs into the well, add the rapeseed oil and whisk to incorporate, gradually adding the milk as you do so. The batter should be smooth and about the thickness of single cream. Heat a non-stick crepe pan, and wipe it with oiled kitchen roll. Pour in a ladleful of the batter and swirl around to coat the base of the pan. Cook for 1-2 minutes, until golden, then flip the crepe over and cook for another minute. Transfer to a plate and keep warm. Repeat with the remaining batter to make 8 crepes. Cube the potatoes and cook in boiling salted water for 15 minutes or until tender. Drain and set aside. Poach the smoked haddock in the milk for 5 minutes. Remove with a fish slice, flake and set aside. Reserve the milk for the sauce. In a large saute pan melt the butter and add the sliced leeks. Cook over a gentle heat for approximately 10 minutes until softened. Stir in the flour to make a roux and cook for 1 minute. Stir in the reserved milk, a little at a time, making sure to combine well so that no lumps form. Add the cubed, potatoes, flaked smoked haddock and chopped parsley. Season to taste with black pepper. The Cullen Skink Crepes can either be served immediately as individual folded filled pancakes. Alternatively they can be filled, rolled and baked in the oven for 20 minutes at 200c.